Our Fitness & Freshness feature now works for all activity types. 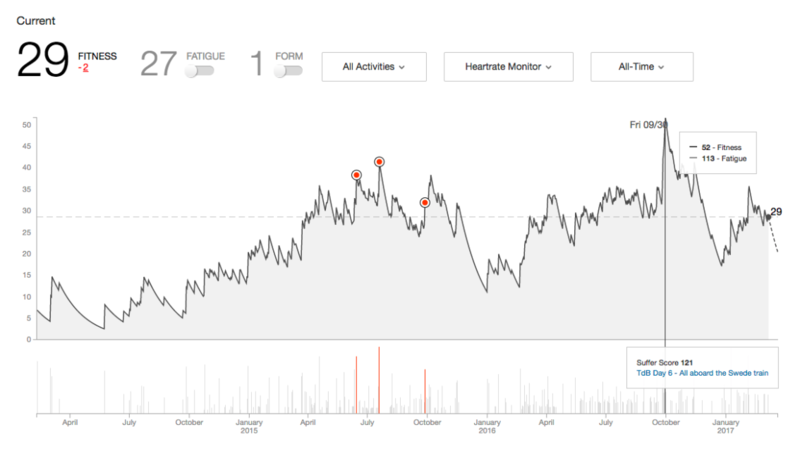 Fitness & Freshness, our Summit heart rate analysis feature, is now available to runners and multi-sport athletes. Cyclists love this heart rate and power meter data deep dive, and we’re excited to bring it to all activity types. It’s a great tool to chart your improvement over time and show up to races and big events in peak shape. This popular Strava feature has been requested by athletes who record their heart rate for all types of fitness activities. Whether you do a virtual ride on a trainer or run laps around a track, as long as you use a heart rate monitor along with a GPS activity it will appear in your graph on Strava.com. Fitness & Freshness shows your current fitness score and how it’s changed over the past seven days. Easily toggle your fatigue and form scores on to get a different look at your strength gains over time. And filter between cycling, running, and all sports to see how different kinds of training impact your Fitness & Freshness levels. If you’ve logged a lot of activities with a heart rate monitor before, you’ll see these graphs the first time you visit Fitness & Freshness, along with red circles to indicate races. And if you start logging your heart rate now, you’ll begin to see how your fitness changes over time after about a half dozen uploads. You’ll learn what your baseline is, when to rest, and when you can push it. We realize if you haven’t been using a heart rate monitor, this feature can be tricky to figure out. So we’ve pulled together a few examples of how athletes in our community are putting this tool to work. Many athletes struggle with this one. Triathletes in particular have to juggle it all, fitting in multiple sports in a week, sometimes multiple activities in a day, and that can make it tough to know when to chill out. Liz Abbett told us, “I started tracking my heart rate to keep myself from working too hard. If I can keep an eye on my fatigue and I see it’s getting high then maybe it’s a good time to take a couple days pretty easy.” There are periods of time where she runs or swims more than she rides, and now the Fitness & Freshness graph reflects all of her HR-based activities, giving her a more honest look at how fatigued she actually is. Liz also works with a coach that repeatedly tells her, “Do your hard workouts hard, easy workouts easy.” Liz explained that while that might seem obvious, “Most endurance athletes are guilty of training too much in the gray area of zone 3 – not pushing hard enough to get the speed and strength benefits of anaerobic training but going harder than necessary to get the aerobic benefits, resulting in unnecessary stress on the body.” And she uses Fitness & Freshness specifically to compare workouts as she ramps up her training for the next big triathlon. While this is only six ways to use Fitness & Freshness, we are sure there are dozens more.